Many know Ray Quinn as one of the stars of X Factor in 2006, where came second to Leona Lewis, but shot to fame for his insurmountable talent and exuberant, lovable personality. Ray’s career was launched stratospherically and his crooner style and penchant for swing made him undoubtedly one of the stars of the show from the start. He became the first person ever to have a number-one album without releasing a single, when his debut album ‘Doing It My Way’ reached number-one on the UK Album Charts in March 2007, the album also went Platinum in its first week. In 2009, Ray became a household name when he won the fourth series of Dancing on Ice and starred as Danny in the West End production of Grease. He went on to win the final Dancing on Ice All Stars series in 2014. Ray’s latest release, ‘Old Soul; Young Blood’ has a refreshed and mature sound. It was recorded in New York and produced by David Finck, who has worked with the likes of Elton John, George Michael and Rod Stewart, to name a few. Ray Quinn appears at The Apex on Tuesday 13 October at 7.30pm. 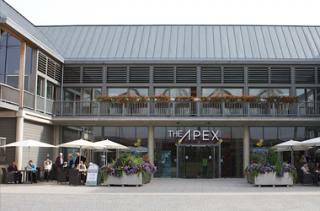 Tickets are £19.50 (£17.50 concessions), call the Box Office on 01284 758000, or visit www.theapex.co.uk for more information, or to book. 1921 is a brand new Restaurant and Canapé Bar on Angel Hill in Bury St Edmunds.